Join our heroine, Starlight Mint, as she fights to rescue her land from the evil Candy King ... and learns about Intellectual Property law along the way! 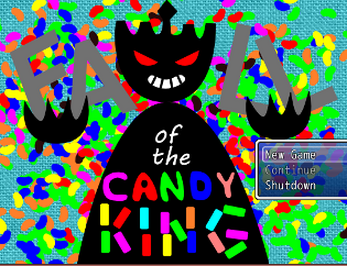 Fall of the Candy King is a console-style role-playing game that tests your knowledge of Intellectual Property Law while you talk to adorable candies. It was written for the Candy Jam 2014, in protest of King Ltd's litigious actions. Are you smart enough to beat the Candy King? Use an unzipping program (I recommend 7Zip) to extract the installer from the archive, then double click on it to install the game. Once it's installed, click 'game' in the game's folder to play!